AmaWaterways today announced plans for AmaMagna, its biggest ship ever, to be launched in 2019. The 194-guest AmaMagna represents a new concept specifically designed to elevate the modern luxury market. Twice the width of traditional European river ships, the ship affords luxurious living spaces, multiple dining options including an al fresco glass-enclosed restaurant, more onboard activities, and enhanced evening entertainment. AmaMagna will also debut a quieter and more fuel-efficient engine and — a first for river cruising — an open-water sports platform complete with Zodiacs, canoes, and other recreational equipment. 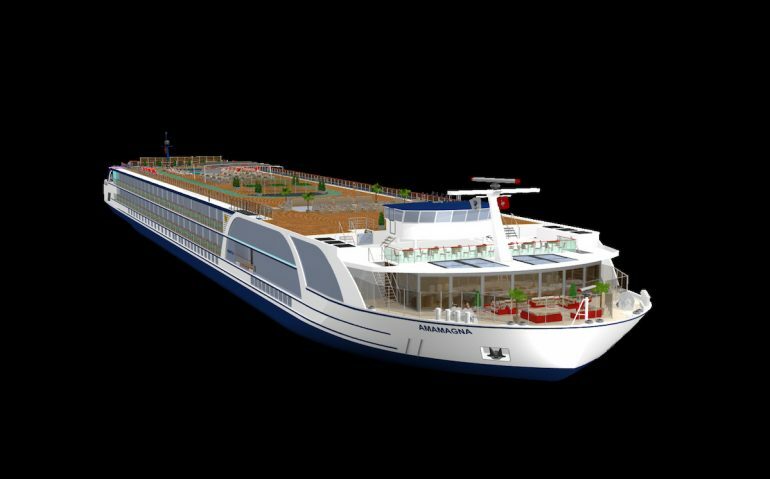 Construction for the new ship, which will sail Danube River itineraries, began March 6, 2017. In total, AmaMagna will feature 97 staterooms — the majority of which will be more than 300 square feet, some of the largest in river cruising. Additional amenities include a large heated sundeck swimming pool with whirlpool and sky bar, a spacious spa area with new treatments, a fitness room large enough for small group classes, and generous common areas designed to accommodate a variety of onboard events. In other news, AmaWaterways welcomed a new ship to the fleet this week with a christening ceremony in Lahnstein, Germany. AmaKristina was christened by godmother (and namesake) Kristin Karst, the co-founder and CEO of AmaWaterways. The ship is the 20th to join the AmaWaterways fleet, and marks the line’s 15-year anniversary.